The Hook Knife blade is curved, similar to a gouge, for working in hollows with ease and fast stock removal. 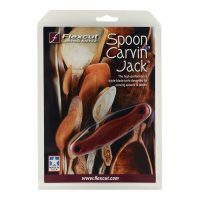 The Hooked Skew Knife features a hooked radial bevel and is perfect for waterfowl carving and cleaning. It also can be used to make v-cuts using a rolling action. The handle shape holds like a pencil or conventional knife. 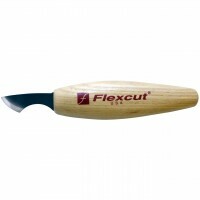 The Radius Knife has a curved bevel and blade for making push cuts, slice cuts and v-shaped cuts. The skewed curvature of the bevel allows for a rolling action and allows for a different approach. The handle shape holds like a pencil or conventional knife. 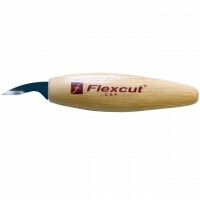 Our Hip Knife (Cutting Knife) is a fine cutting tool that handles a wide range of woodcarving projects. The knife comes in a handsome leather sheath that attaches to any belt. The Mini-Detail Knife has our smallest 3/4″ straight blade. 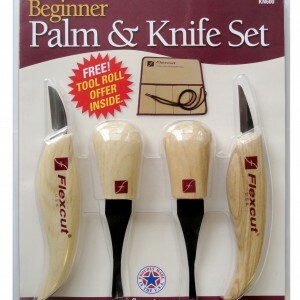 It is made from ultra-thin material to not disturb adjacent wood for very delicate cuts. 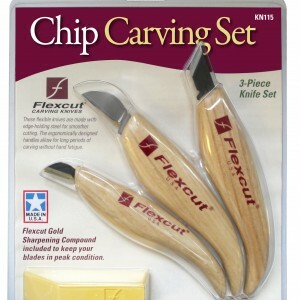 The Mini-Chip Carving Knife has a 5/8″ ultra-thin blade, making unwanted chipping in delicate cuts less likely. Our Mini-Pelican Knife offers the same features as its larger brother (KN18) but with a 7/8″ ultra-thin blade for the lowest resistance when fine cutting is required. The Pelican Knife has a curved 1-5/8″ blade that offers a clean slicing action similar to a skew. The point is narrowed for a tight turning radius while still being durable. 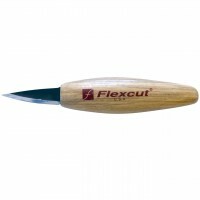 Our Roughing Knife features a straight, 2″ blade for heavier stock removal with a rounded durable point. 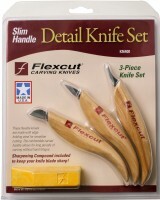 The Detail Knife has a very fine point for making the very narrow cuts associated with detailing. 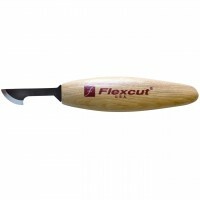 Its straight 1-1/2″ blade can accommodate larger stock removal if needed. 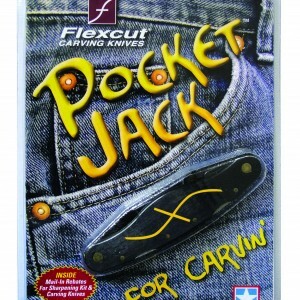 The Carvin’ Jack is a complete carving kit in your pocket. 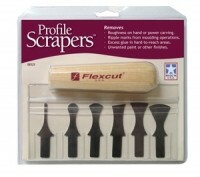 At 3.5 ounces and a closed length of 4-1/4″, it features 6 locking edge tools. Each kit also includes a leather belt mounted sheath, a custom fit SlipStrop and Gold Polishing compound. 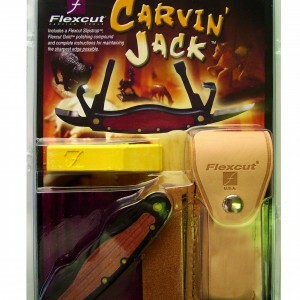 This Flexcut Jack-Knife is a smaller version of our original Carvin’ Jack, the first folding multi-tool designed specifically for the needs of woodworking. 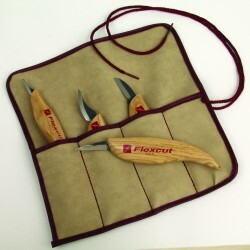 At 3 ounces and a closed length of 4-1/4”, it features 4 locking edge tools. 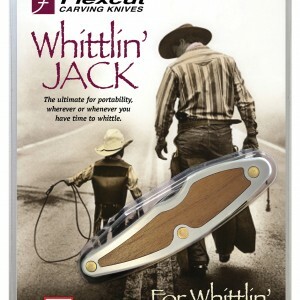 The Whittlin’ Jack features a 1 1/2″ Detail Knife and a 2″ Roughing Knife. It weighs 3 ounces and is just over 4″ long when closed. 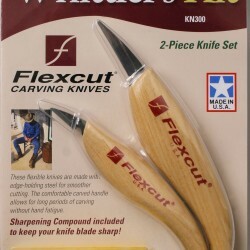 Our Deluxe Knife Set features the most extensive collection of fixed blade carving knives in the industry to give carvers a wide range of capabilities in one economical package. 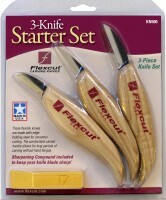 This set includes 18 razor-sharp carving knives designed for roughing to very detailed carving projects. Knives included: KN11 Skew Knife, KN12 Cutting Knife, KN13 Detail Knife, KN14 Roughing Knife, KN15 Chip Carving Knife, KN18 Pelican Knife, KN19 Mini-Pelican Knife, KN20 Mini-Chip Knife, KN26 Right-Handed Hook Knife, KN27 Mini-Detail Knife, KN28 Upsweep Knife, KN31 Mini-Detail Skew Knife, KN32 Detail Skew Knife, KN33 Hooked Push Knife, KN34 Skewed Detail Knife, KN35 Fine Detail Knife, KN36 Radius Knife, KN37 Hooked Skew Knife.